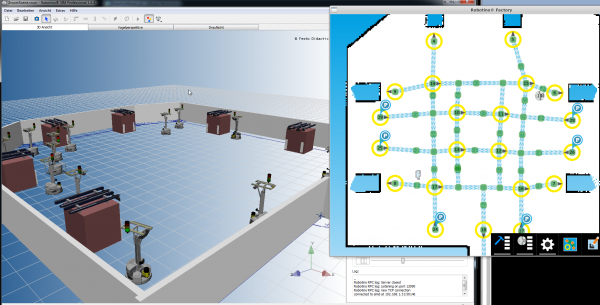 Simulate all aspects of Robotino wihtin a physical 3D simulation environment. Robotino SIM Professional is the perfect tool to simulate Robotino in environments created by yourself. All sensors/actors) of Robotino are simulated (including the new laser rangefinder and the manipulator). Free version of the Robotino simulator. Lets you simulate Robotino's drivesystem, distance sensors, camera and more. See Package links for download details. One way to build a complete Simulation environment involves setting up Robotino SIM in combination with virtual machines that emulate a Robotino and RobotinoFactory. /etc/robotino/smartsoft_slave.conf: enter the Robotinos own IP here, give it a unique ID(RobotinoName) and enter the address and port of the RobotinoSIM machine. The port needs to be the one set up in the simulation under the "plugin" tab when selecting the simulated Robotino. All these settings can also be adjusted through the Robotino Web Interface. (optional) In case you cloned the VM for multiple simulated robots you may want to adjust the host names of the machines to get better descriptive names when connecting to them via ssh or vnc. 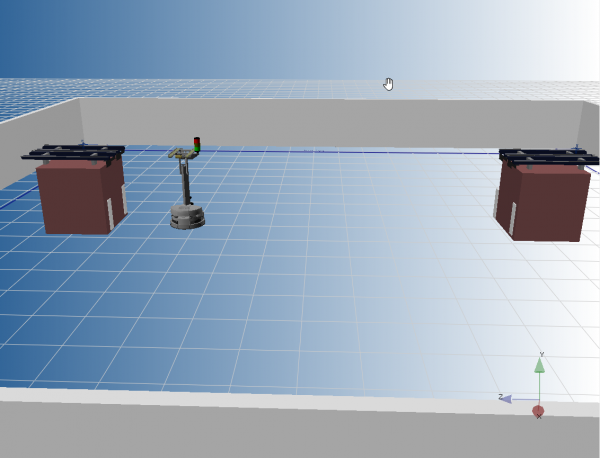 A basic example of a simple work environment where the Robotino moves between two machines in a room. The workspace is simply defined as two nodes in front of each of the machines. A more complex setup where a large number of robotinos share a wide workspace with multiple machines. The path network is set up in a way that allows multiple Robotinos to move simultaneously. The double roundabout helps the robots to avoid each other while moving towards their goal positions. Generally, it is advisable to arrange the nodes in a near perpendicular angle and avoid overlap of paths as much as possible. Be mindful that one- and two-way paths can make a big difference in how the navigation network is used by the robots. This page was last edited on 21 September 2018, at 10:31.